If Vaccines Injure Pregnant Women or Their Unborn Babies, What Will the Vaccine Court Do? This public comment is being submitted on behalf of more than 200,000 supporters of the nonprofit National Vaccine Information Center, a charity founded in 1982 by parents of DPT vaccine injured children to prevent vaccine injuries and deaths through public education. 1 I was among the parent co-founders who worked with Congress in the early 1980s to secure informing, recording, reporting and research provisions in the National Childhood Vaccine Injury Act of 1986, and to develop a Vaccine Injury Table for the Vaccine Injury Compensation Program (VICP) created by Congress under that historic law. 2 3 4 Information about the law can be found at NVIC.org. We are here today because in 2016, Congress amended the 1986 Act to add vaccines recommended by the CDC for routine administration to pregnant women to the Vaccine Injury Table. That amendment would not have been included in the 21st Century Cures Act 5 without the strong support of the Department of Health and Human Services, which has been advocating since 2013 for this addition. 6 7 Congressional action was required to do it because the 1986 Act was not about vaccines recommended for adults or unborn babies developing in the womb. Maternal vaccination policy has preceded the science. Currently, pertussis containing and influenza vaccines account for the majority of federal compensation awards, although two out of three vaccine injury claims are denied. 49 These vaccines contain adjuvants and other ingredients known to be neurotoxic 50 51 52 53 54 but have not been evaluated for neurotoxic, genotoxic, 55 or adventitious agent 56 effects or stimulation of intrauterine inflammation in the pregnant woman or her fetus that may cause miscarriage or brain injury or otherwise damage the health of the baby after birth. In this regard, there have been two signals, one for miscarriage and one for clinical chorioamnionitis associated with vaccines given to pregnant women. 57 58 59 These two adverse outcomes should be added to the Vaccine Injury Table for maternal vaccines, in addition to the serious complications of encephalitis/encephalopathy and Guillain Barre syndrome already listed for these vaccines on the Table. Emerging scientific evidence confirms that not only is there a fundamental lack of scientific understanding about how infectious diseases and vaccines stimulate natural or artificial immunity in the body at the cellular and molecular level, but there are basic science knowledge gaps about how infections and vaccines cause complications leading to injury and death. 65 Future genetically engineered vaccines recommended for pregnant women will contain new ingredients to which pregnant women and unborn babies have never been exposed. 66 It is urgent that this federal agency responsible for protecting the public health fully comply with the vaccine safety research provisions in the 1986 law 67 by funding independent research to develop pathological profiles based on cellular, molecular and other biological evidence for the purpose of creating vaccine contraindications that will prevent harm, and to facilitate the awarding of vaccine injury compensation when there is evidence of harm. Thank you for your consideration of this public comment. 1 National Vaccine Information Center. NVIC: About Us. 2018. 2 Public Law 99-660. Title III – National Childhood Vaccine Injury Act of 1986. 42 USC 300aa. Nov. 14, 1986. 3 Fisher BL. Statement of National Vaccine Information Center: Compensating Vaccine Injuries: Are Reforms Needed? U.S. House Subcommittee on Criminal Justice, Drug Policy and Human Resources Hearing Sept. 28, 1999. 4 Fisher BL. The Vaccine Injury Compensation Program: A Failed Experiment in Tort Reform. Advisory Commission on Childhood Vaccines Nov. 18, 2008. 5 Nair N. The 21st Century Cures Act and the National Vaccine Injury Compensation Program (VICP). National Vaccine Advisory Committee Feb. 7, 2017. 6 National Vaccine Advisory Committee. Maternal Immunization Working Group: Proposed Recommendations. June 2013. 7 Orenstein WA, Gellin BG et al. The National Vaccine Advisory Committee: Reducing Patient and Provider Barriers to Maternal Immunizations. Public Health Rep 2015; 130(1): 10-42. 8 Institute of Medicine and National Research Council. The Rationale for Providing Compensation for Vaccine-Related Injury. Chapter 9: Vaccine Injury Compensation and Liability Remedies. Vaccine Supply and Innovation 1985. Washington, DC: The National Academy Press. (pp. 148-151). 9 Myers PH. Fixing the Flaws in the Federal Vaccine Injury Compensation Program. Administrative Law Review 2011; 65(4): 785-851. 10 Mariner WK. Innovation and Challenge: The First Year of the National Vaccine Injury Compensation Program. Report prepared for Administrative Conference of the United States 1991. 11 CDC. 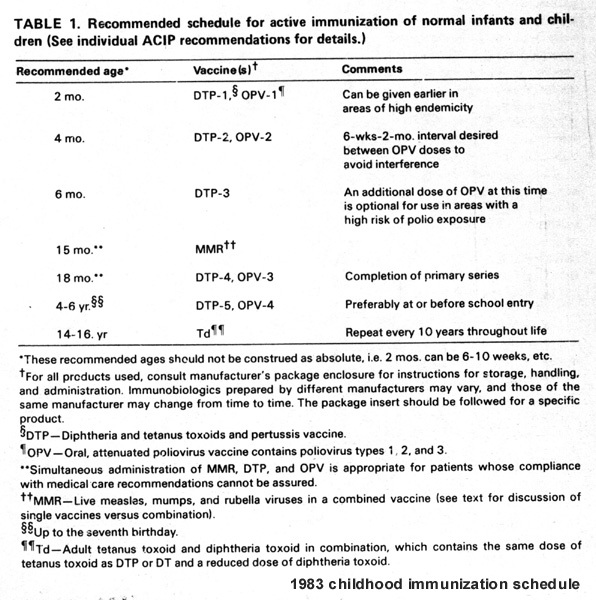 Recommended schedule for active immunization of normal infants and children - 1983. 12 FDA. Vaccines Licensed for Use in the U.S. Mar. 29, 2018. 13 CDC. Recommended Immunization Schedule for Children and Adolescents Aged 18 Years or Younger, United States, 2018. Jan. 1, 2018. 14 42 USC Chapter 6A, Subchapter XIX: Vaccines. Public Health Service. National Childhood Vaccine Injury Compensation Act of 1986 with amendments. 15 DHHS. National Vaccine Injury Compensation Program Revision of the Vaccine Injury Table Final Rule. Federal Register Feb. 8, 1995; 60(26): 7678-7696. 16 Allen A. Shots in the Dark. Washington Post Aug. 30, 1998. 17 U.S. Supreme Court. Brief for the United States as Amicus Curiae Supporting Respondent in Bruesewitz v Wyeth. July 30, 2010. 18 U.S. Supreme Court. Brief of GlaxoSmithKline, Merck Sharp & Dohme Corp. and Sanofi Pasteur, Inc. as Amici Curiae in support of respondent in Bruesewitz v Wyeth. July 30, 2010. 19 Supreme Court of the United States. Bruesewitz v. Wyeth No. 09-152. Justice Sotomayor with whom Justice Ginsberg joins, dissenting Feb. 22, 2011. 20 National Vaccine Information Center. National Vaccine Information Center Cites “Betrayal” of Consumers by U.S. Supreme Court Giving Total Liability Shield to Big Pharma. NVIC Press Release Feb. 23, 2011. 21 HRSA. Seeking Public Comments on the Notice of Proposed Rulemaking: National Vaccine Injury Compensation Program: Adding the Category of Vaccines Recommended for Pregnant Women to the Vaccine Injury Table. National Vaccine Injury Compensation Program News: September 2018. 22 Mor G, Cardenas I. The Immune System in Pregnancy: A Unique Complexity. Am J Reprod Immunol. Jun. 2010. 63(6): 425–433. 23 Zouikr I, Tadros MA et al. Altered nociceptive, endocrine, and dorsal horn neuron responses in rats following a neonatal immune challenge. Psychoneuroendocrinology 2014; 41: 1-12. 24 Regan AK. The Safety of Maternal Vaccination. Hum Vaccin Immunother 2016; 12(12): 3132-3136. 25 Food and Drug Administration. FDA Update: Vaccines for Use in Pregnancy to Protect Young Infants from Disease. Vaccines & Related Biological Products Advisory Committee Nov. 13, 2015. 26 Ladhani SN, Andrews NJ, Southern J, Jones CE, Amirthalingam G, Waight PA, et al. Antibody responses after primary immunization in infants born to women receiving a pertussis-containing vaccine during pregnancy: single arm observational study with a historical comparator. Clin Infect Dis 2015; 61:1637–44. 27 Feunou PF, Mielcarek N, Locht C. Reciprocal interference of maternal and infant immunization in protection against pertussis. Vaccine 2016; 34(8): 1062-1069. 28 Maertens K, Burbidge P et al. Pneumococcal Immune Response in Infants Whose Mothers Received Tetanus, Diphtheria and Acellular Pertussis Vaccination During Pregnancy. Ped Infect Dis J 2017; 36(12): 1186-1192. 29 Schlaudecker EP, Ambroggio L et al. Declining responsiveness to influenza vaccination with progression of human pregnancy. Vaccine 2018; 36(31): 4734-4741. 30 Halperin SA, Langley JM et al. A Randomized Controlled Trial of the Safety and Immunogenicity of Tetanus, Diphtheria, and Acellular Pertussis Vaccine Immunization During Pregnancy and Subsequent Infant Immune Response. Clin Infect Dis July 13, 2018. 31 Wilcox CR, Jones CE. Beyond Passive Immunity: Is There Priming of the Fetal Immune System Following Vaccination in Pregnancy and What Are the Potential Clinical Implications? Front Immunol 2018; 9(1548). 32 Institute of Medicine Vaccine Safety Committee. Adverse Effects of Pertussis and Rubella Vaccines. Washington, DC. The National Academies Press. 1991. Afterword on Research Needs. (p. 206). 33 Institute of Medicine Vaccine Safety Committee. Adverse Events Associated with Childhood Vaccines: Evidence Bearing on Causality. Washington, D.C. The National Academies Press 1994. Need for Research and Surveillance. (pp. 305 & 307). 34 Institute of Medicine Vaccine Safety Forum. Howe CJ, Johnston RB, Fenichel GM, Editors. Summaries of Two Workshops. Washington, D.C. The National Academy Press 1997. 35 Institute of Medicine Committee to Review Adverse Effects of Vaccines. Evaluation of Biologic Mechanisms of Adverse Effects: Increased Susceptibility. (p. 82). Washington, D.C. The National Academies Press 2012. 36 Institute of Medicine Committee on the Assessment of Studies of Health Outcomes Related to the Recommended Childhood Immunization Schedule. The Childhood Immunization Schedule and Safety Stakeholder Concerns, Scientific Evidence and Future Studies. Summary (p. 5-6). Washington, D.C. The National Academies Press 2013. Summary of Scientific Findings. (pp. 129-130). 37 National Vaccine Information Center. NVIC Supports Three of Five Recommendations of New IOM Report on U.S. Childhood Immunization Schedule Safety and Calls for Transparency. BusinessWire Jan. 16, 2013. 38 Pulendran B, Ahmed R. Immunological mechanisms of vaccination. Nat Immunol 2011; 12(6): 509-517. 39 Saul N, Wang K et al. Effectiveness of maternal pertussis vaccination in preventing infection and disease in infants: The NSW Public Health Network case-controlled study. Vaccine 2018; 36: 1887-1892. 40 Institute of Medicine Committee to Review Adverse Effects of Vaccines. Evaluation of Biologic Mechanisms of Adverse Effects: Increased Susceptibility. (p. 82). Washington, D.C. The National Academies Press 2012. 41 Roberts JN, Gruber MF. Regulatory considerations in the clinical development of vaccines indicated for use during pregnancy. Vaccine 2015; 33(8): 966-972. 42 Drugs.com. FDA Pregnancy Categories. 43 FDA. Vaccines Licensed for Use in the U.S. Mar. 29, 2018. 44 Groom HC, Irving SA et al. Uptake and safety of Hepatitis B vaccination during pregnancy: A Vaccine Safety Datalink study. Vaccine Sept. 4, 2018. 45 Blanco JCG, Pietneva LM et al. Efficacy of a respiratory syncytial virus vaccine candidate in a maternal immunization model. Nat Commun 2018; 9: 1904. 46 Dzanibe S, Mahni SA. Systematic review of the clinical development of group B streptococcus serotype-specific capsular polysaccharide-based vaccines. Exp Rev Vaccines 2018; 17(7). 47 Munoz FM. Current challenges and achievements in maternal immunization research. Front Immunol 2018; 9(436). 48 Supreme Court of the United States. Bruesewitz v. Wyeth No. 09-152. Justice Sotomayor with whom Justice Ginsberg joins, dissenting Feb. 22, 2011. 49 HRSA. Vaccine Injury Compensation Program (VICP) Data & Statistics. Aug. 31, 2018. 50 Burbacher TM, Shen DD et al. Comparison of Blood and Brain Mercury Levels in Infant Monkeys Exposed to Methylmercury or Vaccines Containing Thimerosal. National Center for Biotechnology Information, U.S. National Library of Medicine Apr. 21, 2005. 51 Shaw CA, Tomlejenovic L. Aluminum in the central nervous system (CNS): toxicity in humans and animals, vaccine adjuvants, and autoimmunity. Immunol Res. 2013; 56;(2-3):304-16. 52 Herberts C, Melger B et al. New adjuvanted vaccines in pregnancy: what is known about their safety? Exp Rev Vaccines 2010; 9(12). 53 Kataoka M, Ochiai M et al. A need for careful evaluation of endotoxin contents in acellular pertussis-based combination vaccines. Biologicals 2012; 40(1): 49-54. 54 Fisher BL. Are Vaccine Ingredients Safe? National Vaccine Information Center Jan 26, 2018. 55 FDA. Guidance for Industry: S2(R1) Genotoxicty Testing and Data Interpretation for Pharmaceuticals Intended for Human Use. CDER and CBER June 2012. 56 FDA. Guidance for Industry: Characterization and Qualification of Cell Substrates and Other Biological Materials Used in the Production of Viral Vaccines for Infectious Disease Indications. CBER February 2010. 57 Donahue JG, Kieke BA et al. Association of spontaneous abortion with receipt of inactivated influenza vaccine containing H1N1pdm09 in 2010-11 and 2011-12. Vaccine 2017; 35(40): 5314-5322. 58 Kharbanda EO, Vasquex-Benitez G et al. Evaluation of the association of maternal pertussis vaccination with obstetric events and birth outcomes. JAMA 2014; 312(18): 1897-1904. 59 Romero R, Chaemsaithong P et al. Clinical chorioamnionitis at term V: umbilical cord plastma cytokine profile in the context of a systemic maternal inflammation response. J Perinat Med 2016; 44(1): 53-76. 60 Harvey L, Boksa P. Prenatal and postnatal animal models of immune activation: Relevance to a range of neurodevelopmental disorders. Dev Neurobiol 2012; 72(1): 1335-1348. 61 Brown AG, Tulina NM et al. Exposure to intrauterine inflammation alters metabolomics profiles in the amniotic fluid, fetal and neonatal brain in the mouse. PLOS One Oct. 19, 2017. 62 Ghassabian A, Albert PS et al. Gestational cytokine concentrations and neurocognitive development at 7 years. Transl Psychiatry 2018; 8:64. 63 Tilley SK, Joseph RM et al. Genomic markets of prenatal intrauterine inflammation in umbilical cord tissue predict later life neurological outcomes. PLOS One 2017; 12(5). 64 Donowitz JR, Cook H et al. Role of maternal health and infant inflammation in nutritional neurodevelopmental outcomes of two-year-old Bangladeshi children. PLOS Negl Trop Dis 2018; 12(5). 65 Flaxman A, Ewer KJ. Methods for Measuring T-Cell Memory to Vaccination: From Mouse to Man. Vaccines 2018; 6(43). 66 Liao W, Zhang TT et al. Integration of Novel Materials and Advanced Genomic Technologies into New Vaccine Design. Curr Top Med Chem 2017; 17(20): 2286-2301. 67 42. U.S.C. 300aa-1. Establishment – Related Studies and Study of Other Vaccine Risks. 68 Fisher BL, Wrangham TK. Public Comment of National Vaccine Information Center for NVPO on Draft NVAC Maternal Immunization Working Group Recommendations on Maternal Immunizations. Apr. 25, 2014. 70 Fisher BL, Wrangham TK. Public Comment on the Maternal Immunization Working Group Phase II’s Draft Report and Draft Recommendations for Overcoming Barriers and Identifying Opportunities for Developing Maternal Immunizations for Consideration by the National Vaccine Advisory Committee. Sept. 9, 2016. 71 Fisher BL, Wrangham TK. Public Comment of National Vaccine Information Center for FDA NPRM on “Pregnant Women: Scientific and Ethical Considerations for Inclusions in Clinical Trials: Draft Guidance; Availability. June 9, 2018. 72 Fisher BL. Forced Vaccination: The Tragic Legacy of Jacobson v. Massachusetts. National Vaccine Information Center Nov 2, 2016. 73 National Vaccine Information Center. Cry for Vaccine Freedom Wall. Look at the "Business Judgment Rule". Hold ALL doctors involved PERSONALLY liable. Tell all doctors involved to put their money where their mouth is!!! NO PREGNANT WOMAN should ever receive any vaccine! Following the so-called Swine Flu "epidemic" of 2009, among the pregnant women who agreed to be inoculated against this "epidemic" there were several thousand SPONTANEOUS ABORTIONS! GOD FORBID! THERE IS A REAL CONSPIRACY TO DEPOPULATE OUR COUNTRY AND THE WORLD USING VACCINES! Great thanks to Barbara Loe Fisher for her untiring dedication to this important subject of vaccine safety. Its beginning to look like the term "Vaccine safety" represents something that we may never achieve. I hope one day the public will rise up to say as one "Where there is risk, there must be choice"
it's incomprehensible that the regulatory agencies that are supposed to be safeguarding our children's health are adding more vaccines to the schedule when the health of American children is already lower than the other developed countries and our vaccine schedule is so much more and sooner than those countries. We need to figure out exactly why our children's health is so poor and until we do, the entire vaccine program should be suspended. Yes! Great information. Thank you for sharing. Informed consent should be provided with all medical treatments and procedures, and the risks should always be discussed. And we should have the right to approve or deny medical interventions based on our health, personal, philosophical and religious beliefs. No one should be given the power to mandate medical treatments for children or adults. This should not even be a point of discussion. When you study the vaccine inserts, just about none of them state they are safe (or tested) for pregnant [human] women, fetuses and infants. That's right. None! They just don't want to admit what they discovered through animal studies and those subject to forced vaccinations. That would be military and prisoners. My RA flu shot case was settled in vaccine court. I received the vaccine while pregnant and immediately fell ill. My son was born at a healthy 9.5lbs but spent 10 days in the NICU with respiratory issues of “unknown etiology”. He was diagnosed with severe autism at 18 months. The impact on him was ignored. I was compensated. I was bullied by my midwife into taking the flu shot. A law needs to be passed that requires all vaccine recipients and guardians of recipients to sign off on receipt of the package insert. Period.